World premiere: The new BMW 6 Series Convertible. Its world premiere is one of the highlights of the 2011 NAIAS and a dazzling performance on the road certainly awaits it: the new BMW 6 Series Convertible fulfils the desires of demanding automobile connoisseurs for fascinating aesthetics, superior driving dynamics and progressive luxury in an open-top premium automobile of the upper class. The new version of this great BMW convertible impresses with the athletic elegance of the bodywork and the soft top in the characteristic fin look. In the sophisticated interior of the four-seater, the elegantly flat, free-standing Control Display of the iDrive operating system, supplied as standard equipment, lends an exclusive touch. The driving experience is characterised by optimised comfort and a heightened level of sporting zest. The market launch in the USA will be made with the BMW 650i Convertible. Its V8 power unit with BMW TwinPower Turbo and direct fuel injection delivers 400 hp (300 kW/407 bhp) and can be combined with either a six-speed manual transmission, or an eight-speed automatic sports transmission. World premiere: The BMW 1 Series M Coupe. For the first time, BMW M GmbH has extended its range of high-performance sports cars and now covers the compact vehicle segment. 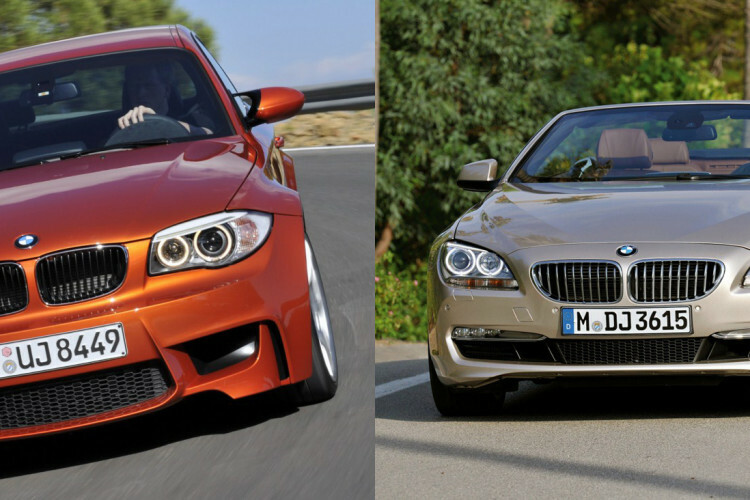 The BMW 1 Series M Coupe, which embodies the typical M characteristics in a particularly concentrated form, will be presented at the 2011 NAIAS. A 250 kW/340 bhp six-cylinder inline engine with M TwinPower Turbo, chassis technology derived directly from the motor racing track, a high power to weight ratio, athletic design with innovative aerodynamic features and an exclusive interior conceived for concentrated driving pleasure combine to form a harmonious overall concept, which paves the way for new target groups to be led to the unmistakable M Feeling. All of this makes the BMW 1 Series M Coupe a high-performance sports car, which meets the challenges of the race track just as comfortably as the demands of everyday driving. World premiere: The new BMW 1 Series Coupe, the new BMW 1 Series Convertible. Outstanding driving pleasure in the compact segment is now more attractive than ever. With targeted design modifications, which optimise not only the appearance of the vehicles but also their aerodynamic properties, the new BMW 1 Series Coupe and the new BMW 1 Series Convertible are being presented to the world’s media for the first time at the 2011 NAIAS. There are two engines available for each of the two models in the USA. Modern six-cylinder engines, rear wheel drive, high-quality chassis technology, innovative features and equipment as well as premium quality propel them to an exceptionally advantageous position in their competitive field. The attraction: The new BMW X3. With more sporting zest, driving comfort, interior space and flexibility, the new BMW X3 significantly extends the lead in the market segment created by its predecessor. The two engines available at market launch also set new standards in efficiency. In addition, the new BMW X3 is the first BMW X model to be fitted with electro-mechanical power steering as standard equipment and, as an option, Dynamic Driving Control. Furthermore, BMW ConnectedDrive driver assistance systems, including Adaptive Cornering Headlights, Head-Up Display and a reversing camera with Top View are available for the new BMW X3; all unmatched in its market segment. Innovation: BMW EfficientDynamics – a new richness of diversity. Throughout the world, BMW EfficientDynamics sets standards for outstanding driving pleasure while continuously reducing fuel consumption and emissions. This is made possible by new engines with enhanced degrees of efficiency, the optimisation of weight and aerodynamics and additional consumption reduction technologies. Innovations such as Brake Energy Regeneration and electro-mechanical power steering are being fitted as standard equipment to more and more models and successively introduced into all of the world’s automotive markets. BMW has indicated the path to completely CO2-free mobility with the development of concepts for purely electrically-driven vehicles. A further milestone on this route is the testing of the BMW ActiveE by private users in everyday traffic situations. The field trial with this vehicle, driven by an electric engine and based upon the BMW 1 Series Coupe, will begin as early as the summer of 2011 on the roads of a number of North American states. Innovation: The new BMW ConnectedDrive services. By intelligently networking the driver with his vehicle and the outside world, BMW ConnectedDrive creates fascinating possibilities for increasing comfort and safety as well as for optimising the use of infotainment functionality. No other automobile manufacturer offers a similarly comprehensive and innovative selection of driver assistance systems and mobility services. BMW ConnectedDrive is the world leader in integrating smart phones and music players into the vehicle, as well as in the use of Internet-based services for optimising navigational and entertainment functionality.